Konsultāciju laiks: pa e-pastu iepriekš saskaņotā laikā. AMATI: Kopš 2009.: docents, RTU, DITF, Lietišķo datorzinātņu katedra. 2006.-2009.: lektors, RTU, DITF, Lietišķo datorzinātņu katedra. 2005.-2006.: asistents, RTU DITF, Lietišķo datorzinātņu katedra. IZGLĪTĪBA: 2008. gada 28. jūlijs: iegūts inženierzinātņu doktora zinātniskais grāds (Dr.sc.ing.) informācijas tehnoloģijas nozares sistēmu analīzes, modelēšanas un projektēšanas apakšnozarē. 2003.-2006.: Rīgas Tehniskā universitāte, doktorantūras studijas datorzinātnes apakšnozarē. 2000.-2003.: Rīgas Tehniskā universitāte, Datorzinātnes un informācijas tehnoloģijas fakultāte, iegūts inženierzinātņu maģistra grāds (Mg.sc.ing.) datorsistēmās (ar specializēšanos lietišķās datorzinātnēs). 1997.-2000.: Rīgas Tehniskā universitāte, Datorzinātnes un informācijas tehnoloģijas fakultāte, iegūts inženierzinātņu bakalaura grāds (B.sc.ing.) datorvadībā un datorzinātnēs. PAPILDUS: Organizāciju IEEE Computer Society un ACM biedrs. Nazaruka, Ē., Ovčiņņikova, V., Alksnis, G., Sukovskis, U. Verification of BPMN Model Functional Completeness by using the Topological Functioning Model. In: Proceedings of the 11th International Conference on Evaluation of Novel Approaches to Software Engineering (ENASE 2016). paper . Fernández Céspedes, V., Osis, J., Alksnis, G. Lessons Learned by using the Integrated Domain Modeling Toolset. In: Proceedings of the 10th International Conference on Evaluation of Novel Approaches to Software Engineering, Spain, Barcelona, 28-30 April, 2015. Portugal: SCITEPRESS, 2015, pp.352-363. e-ISBN 978-989-758-100-7. DOI, paper . Asņina, Ē., Alksnis, G. Survey on Information Monitoring and Control in Cross-enterprise Collaborative Business Processes. Proceedings of the 7th International Workshop on Information Logistics and Knowledge Supply, Lund, Sweden, September 22nd. CEUR Workshop Proceedings, 2014. Available from: ceur-ws.org. Asņina, Ē., Pudāne, M., Sviķe, M., Alksnis, G. Customer Oriented Management of Changes in ERP Systems: The Vendor's Side. No: Proceedings of 13th International Conference on Perspectives in Business Informatics Research, Zviedrija, Lunda, 22.-24. septembris, 2014. Switzerland: Springer, 2014, 320.-334.lpp. Available from: Springer.com. Asņina, Ē., Pudāne, M., Sviķe, M., Alksnis, G. Customer-Oriented Change Management for ERP Systems // Proceedings of the 15th International Conference on Computer Systems and Technologies (CompSysTech’14), Ruse, Bulgārija, 27. jūnijs. ACM New York, 2014, pp. 333-340. DOI. Alksnis G., Asņina Ē., Sukovskis U. Topological Functioning Model and Services Identification - An Approach for Services Identification from a Topological Functioning Model // Proceedings of the 7th International Conference on Evaluation of Novel Approaches to Software Engineering, Poland, Wrocław, 29.-30. June, 2012. - pp 241-248. Alksnis G. Category Theoretic Integration Framework for Formal Notations in Model Driven Software Engineering// Advances in Databases and Information Systems. Associated Workshops and Doctoral Consortium of the 13th East-European Conference, ADBIS 2009. Revised Selected Papers. Eds: J. Grundspenkis, M. Kirikova, Y. Manolopoulos, L. Novickis. – Springer LNCS Volume 5968/2010. – Springer, 2010. - pp. 177-184. Available from: Springer.com. Alksnis G. Kategoriju teorijas pielietošana formālo specifikāciju valodu integrēšanai modeļu vadāmā arhitektūrā, promocijas darbs. – Rīga: Rīgas Tehniskā universitāte, 2008. – 144 lpp. Alksnis G. Kategoriju teorijas pielietošana formālo specifikāciju valodu integrēšanai modeļu vadāmā arhitektūrā, Promocijas darba kopsavilkums. – Rīga: RTU izdevniecība, 2008. – 31 lpp. Alksnis G. Application of Category Theory to Integrate Formal Specification Languages in Model Driven Architecture, Summary of Doctoral Thesis. – Riga: RTU Publishing, 2008. – 32 p.
Alksnis G. The Analysis of UML State Machine Formal Checking Methods// Proceedings of the 10th International Conference Information System Implementation and Modeling (ISIM'07). Eds: A. Kelemenová, D. Kolář, etc. – Opava: Silesian University, 2007. – pp. 131–136. Available from: ceur-ws.org. Alksnis G. UML stāvokļu mašīnu modeļu formālās pārbaudes metožu salīdzinoša analīze// Computer Science, Applied Computer Systems, Scientific Proceedings of Riga Technical University, Vol.26, Nr.5 – Rīga: RTU izdevniecība, 2007. – 28.–37. lpp. Alksnis G. Formal Methods and Model Transformation Framework for MDA// Proceedings of the 1st International Workshop on Formal Models (WFM'06). Eds. D. Kolář, A. Meduna. – Ostrava: MARQ, 2006. – pp. 87–94. Available from: ceur-ws.org. Alksnis G. Formal Specification Languages and Category Theory Within the Framework of MDA// Computer Science, Applied Computer Systems, Vol.26, Nr.5, Scientific Proceedings of Riga Technical University, Riga: RTU Publishing, 2006. – pp. 33–41. Alksnis G., Asnina E., Osis J., Silins J. Formalization of Software Development: Problems and Solutions// Computer Science, Applied Computer Systems, Scientific Proceedings of Riga Technical University, Vol.22, Nr.5 – Riga: RTU Publishing, 2005. – pp. 204–216. Alksnis G. Formal Specification from Category Theory Viewpoint// Computer Science, Applied Computer Systems, Scientific Proceedings of Riga Technical University, Vol.17, Nr.5 – Riga: RTU Publishing, 2003. – pp. 137–144. Alksnis G. Kategoriju teorija datorzinātnēs un programminženierijā// RITI 8. zinātniskā konference. – Rīga: AS Dati, 2003. – 3.–8. lpp. Alksnis G., Osis J. Formalization of Software Engineering by Means of the Theory of Categories// Computer Science, Applied Computer Systems, Scientific Proceedings of Riga Technical University, Vol.13, Nr.5 – Riga: RTU Publishing, 2002. – pp. 157–163. 2016. gada 27.-28. aprīlis - 11th International Conference on Evaluation of Novel Approaches to Software Engineering (ENASE 2016), Roma, Itālija . 2015. gada 28.-30. aprīlis - 10th International Conference on Evaluation of Novel Approaches to Software Engineering (ENASE 2015), Barselona, Spānija. 2014. gada 22.-24. septembris - International Conference on Perspectives in Business Informatics Research (BIR 2014) un 7th Workshop on Information Logistics and Knowledge Supply (ILOG 2014), Lunda, Zviedrija. 2014. gada 27. jūnijs - International Conference on Computer Systems and Technologies (CompSysTech'14), Ruse, Bulgārija, 2014, ar referātu "Customer-Oriented Change Management for ERP Systems". 2012. gada 29.-30. jūnijs - 7th International Conference on Evaluation of Novel Approaches to Software Engineering (ENASE 2012), Special Session on Model-Driven Architecture and Modeling-Driven Software Development (MDA&MDSD), Wroclava, Polija, 2012, ar referātu "Topological Functioning Model and Services Identification - An Approach for Services Identification from a Topological Functioning Model". 2009. gada 7.-10. septembris – 13th East-European Conference on Advances in Databases and Information Systems (ADBIS 2009), Model-Driven Architecture: Foundations, Practices and Implications Workshop (MDA), Riga, Latvia, 2009, ar referātu "Category Theoretic Integration Framework for Formal Notations in Model Driven Software Engineering". 2007. gada 23.-26. aprīlis - 10th International Conference on Information System Implementation and Modeling (ISIM'07), Hradec nad Moravicí, Czech Republic, 2007, ar referātu "The Analysis of UML State Machine Formal Checking Methods". 2006. gada 12.-13. oktobris – 47. RTU zinātniskā konference, Rīga, ar referātu "Comparative Analysis of UML State Machine Models Formal Checking Methods". 2006. gada 24.-26. aprīlis - 1st International Workshop on Formal Models (WFM'06), Přerov, Czech Republic, 2006, ar referātu "Formal Methods and Model Transformation Framework for MDA"
2005. gada 13.-15. oktobris – 46. RTU zinātniskā konference, Rīga, ar referātu "Formal Specification Languages and Category Theory within the Framework of MDA". 2003. gada 26. novembris – ar maģistra darbu „Kategoriju teorija datorzinātnēs un programminženierijā” piedalījos a/s „DATI” konkursā un VIII. konferencē „Informācijas tehnoloģija: zinības un prakse”. 2003. gada 11. oktobris – 44. RTU zinātniskā konference, Rīga, ar referātu "Formal Specification from Category Theory Viewpoint". 2002. gada 11. oktobris – 43. RTU zinātniskā konference, Rīga, ar referātu "Formalization of Software Engineering by Means of the Theory of Categories". 2002. gada 3.-6. jūnijs – zinātniskā konference Baltic DB&IS 2002, Tallina, ar referātu "Category Theory in Software Engineering". Starptautiskas zinātniskas konferences ENASE 2015, 2016 un 2017 speciālās sesijas MDI4SE organizators. Starptautiskas konferences ICEE-ICIT 2014 lokālās organizācijas komitejas loceklis. Dalība ERAF projekta “Informācijas un komunikāciju tehnoloģiju kompetences centrs” Nr. KC/2.1.2.1.2/10/01/001 individuālajos pētījumos (2013. gada 10. aprīlis - 2015. gada 31. maijs kā Pētnieks p.i.). Starptautiskās zinātniskās konferences Perspectives of Business Informatics Reseach (BIR) 2011 doktorantu konsorcija organizators (2011. gads). Eiropas Sociālā fonda atklātā konkursa projekta, Līg.Nr. 2007/ 0080/ VPD1/ ESF/ PIAA/ 06/ APK/ 3.2.3.2./ 0008/ 0007 „Studiju moduļa izstrāde modeļvadāmai programmatūras attīstības tehnoloģijai datorsistēmas programmā” vadītājs un realizētājs (01.09.2007. – 20.08.2008.). Profesionālās bakalaura studiju programmas "Datorsistēmas" programmēšanas prakses organizators. Sukovskis U., Alksnis G. Platforma .NET (C#). Mācību metodiskais materiāls mācību kursam „Ievads objektorientētā tehnoloģijā” datorzinātnes un informācijas tehnoloģijas akadēmiskās bakalaurantūras 2. kursa studentiem. – RTU, 2007. – 60 lpp. Alksnis G. Objektu ierobežojumu valoda (OCL), darbību semantikas valoda (ASL), standarts „Vaicājumi/Skati/Transformācijas” (QVT). Mācību metodiskais materiāls mācību kursam „Programmatūras attīstības tehnoloģijas” datorzinātnes un informācijas tehnoloģijas akadēmiskās bakalaurantūras 3. kursa studentiem. – RTU, 2007. – 78 slaidi. Rusakovs P., Alksnis G., Ivanovs M., Buzdins D. Modeļvadāmas programmatūras izstrādes mērķplatformas. Mācību metodiskais materiāls mācību kursam „Moderno programmēšanas valodu praktikums” datorzinātnes un informācijas tehnoloģijas profesionālās maģistrantūras 1. kursa studentiem. – RTU, 2007. – 70 slaidi. Rusakovs P., Alksnis G., Ivanovs M., Buzdins D. Lietojumsistēmu realizācija JAVA platformā (J2EE) MDA kontekstā. Mācību metodiskais materiāls mācību kursam „Vizuālā programmēšana” datorzinātnes un informācijas tehnoloģijas profesionālās maģistrantūras 1. kursa studentiem. – RTU, 2007. – 98 lpp. Alksnis G. Web servisu uzbūve. Mācību metodiskais materiāls mācību kursam „Ievads objektorientētā tehnoloģijā” datorzinātnes un informācijas tehnoloģijas akadēmiskās bakalaurantūras 2. kursa studentiem. – RTU, 2007. – 23 slaidi. Ņikiforova O., Rusakovs P., Alksnis G., Asņina Ē., Grāve A., Grigorjevs J., Buzdins D., Pavlova N., Mikojelovs D., Zabiņako V., Ņikuļšins V., Klimavičius M. Akadēmiskās bakalaurantūras diplomdarbu tēmas. Mācību metodiskais materiāls studiju noslēguma darbu (diplomdarbu) izstrādei datorzinātnes un informācijas tehnoloģijas akadēmiskās bakalaurantūras 3.kursa studentiem, 45 tēmas. – RTU, 2007. – 100 lpp. Alksnis G. Objektorientētās programmēšanas praktikums (DPI462). Mācību metodiskais materiāls datorzinātnes un informācijas tehnoloģijas profesionālās maģistrantūras 1.semestra un profesionālās bakalaurantūras 3.semestra studentiem. – RTU, 2007. – 70 slaidi. 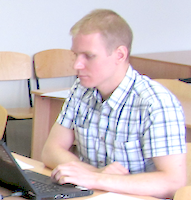 2014. gada 28. janvāris – nokārtojot eksāmenu 70-483 iegūts Microsoft Certified Profesional sertifikāts Programming in C# Specialist. 2009. gada 16. janvāris – Latvijas Universitātes 2008./2009. akadēmiskā gada rudens semestrī noklausīts kurss DatZ6013 „Specifikāciju valodas” 4 kredītpunktu apjomā. Ja kāds no šiem virzieniem šķiet interesants, rakstiet man e-pastu vai nāciet aprunāties - izrunāsimies un precizēsim virziena konkrētu tēmu. Virzienos tiek pieņemta ar .NET tehnoloģijām saistītu rīku/produktu izmantošana, tomēr arī alternatīvās tehnoloģijas (Java Virtual Machine, C/C++) un rīki var tikt izskatīti. Nepieciešamības gadījumā, var tikt izvērtētas arī tēmas citos virzienos.